Captain Lindeman of the S.S. Governor General Loudon recounts his earlier experiences on the island of Merat in the Strait of Sunda, off the coast of Java. “Sunday, 26 August 1883. As we approached the mere spit of an island called Merak, my thoughts recounted days past when I first visited that tropical idyll. How calm and peaceful those days spent in the surf and sand! And how leisurely did I enjoy our games of base ball, which I first introduced to the natives on that outcrop back in ’79. The sandy little clearing at the top of the island’s high point afforded an unobstructed view of the Strait of Sunda, and of the island mountain that was Krakatoa, tall and regal in the distant ocean mist. The Javanese were quick studies to base ball, and once instructed, each insisted on carving his own bat out of the largest branches of cocoanut trees with shark-tooth knives. While they relished the batted ball flying off into the thick tropical forests on the slopes of the hills of Merat, they had little natural inclination to run ’round the field, circling the bases, but instead, would simply stand and watch their handiwork fly off into the humid horizon. As the island’s only pitcher, it was up to me to instill some proper discipline into these half-civilized natives, whistling one speed ball or another close to their ear should they refuse to budge from the batter’s box. Before we’d arrived, their pastimes had consisted of the strange art of diving in the narrow strait to grab onto the backs of mako sharks and ride them on the current. 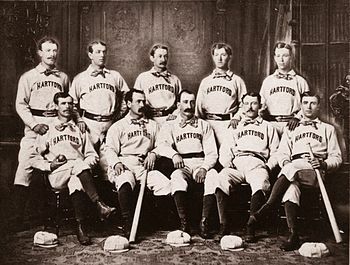 But, within a fortnight, two respectable teams had created an instant sensation among the natives, bare-breasted women ladling water to the weary, though enthusiastic players, naked children prancing and scurrying into and out of the crude baselines as the game progressed, ten thousand kilometers from the Elysian Fields of Hoboken. Second-mate, Live Oak Taylor, of Belfast, Maine had played ball for the Hartford Dark Blues in ’77, and had recently taught me how to curve a ball. Those natives who had been witness to my speed ball, which they called “Crying Lightning,” after the flickering of St. Elmo’s Fire, ubiquitous on some maritime eves, would certainly stand aghast at this newest pitch I would uncork into their wheelhouse. I nearly trembled in anticipation to get back at it on the sands of Merak. “Monday, August 27th. Finding that at midnight on the evening of our arrival there was still no boat come off to us from the shore, and as the weather was now much calmer, I sent the second mate Taylor in the gig with a crew of six men to find out what was the reason of this. About 1 a.m. he returned, and stated that it had been impossible to land on account of the heavy current and surf; also that the harbour pier-head stood partly under water, and that there was no cracks to grasp or gaps to claw. That by 6 p.m. on Sunday evening it had already begun to be stormy, and that the stormy weather had been accompanied by a current which swept round and round (apparently a sort of whirlpool). When the mate had come on board, we resolved to await daylight before taking any further steps. About 7 a.m. we saw some very high seas, presumably an upheaval of the sea, approaching Merat. These seas poured themselves out upon the shore and flowed inland, so that we presumed that the inhabitants who dwelt near the shore must be drowned. The next time I caught my own reflection, the signal beacon was altogether carried away, and the Berouw then lay high upon the shore among the cocoanut trees. Also the revenue cutter lay aground, and some native boats which had been lying in the neighborhood at anchor were no more to be seen. A few islanders must have escaped to the relatively higher ground atop the ball field, but how many? Since it was very dangerous to stay where we were, and since if we stayed we could render no assistance, we concluded to proceed to Anjer under steam, and there to give information of what had taken place, weighed anchor at 7:30 a.m., and following the direction of the bay steered thereupon southwards. 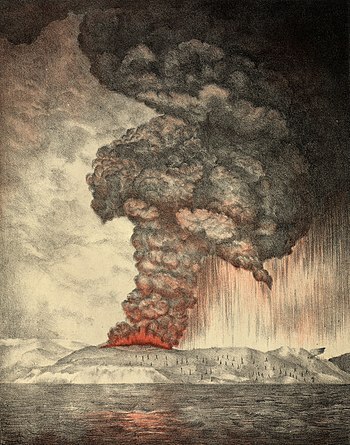 At 10 a.m. we were obliged to come to anchor in the bay in 15 fathoms [27,5m] of water because the ash rain kept continually growing thicker and thicker, and pumice-stone also began to be rained, of which some pieces were several inches thick. Live Oak Taylor and many of the male passengers began to clear these off the deck, lest we should capsize under the weight of this dangerous slop. The air grew steadily darker and darker, and at 10:30 a.m. we were in total darkness, just the same as on a very dark night. The wind was from the west-ward, and began to increase till it reached the force of a hurricane. So we let down both anchors and kept the screw turning slowly at half speed in order to ride over the terribly high seas which kept suddenly striking us presumably in consequence of a “sea quake,” and made us dread being buried under them. The passengers for the most part were sent below. Heavy storms, and prayers for any who made it alive to the top of Merat. The lightning struck the mainmast conductor six or seven times, but no damage. The rain of pumice-stones changed to a violent mud rain, and this mud rain was so heavy that in the space of ten minutes the mud lay half a foot deep. Kept steaming with the head of the ship as far as possible seawards for half an hour when the sea began to abate, and at noon the wind dropped away entirely. Then we stopped the engine. The darkness however remained as before, as did also the mud rain. It was later reported that of the approximately 2,700 people on the island of Merak, only three survived the 135 foot tidal wave. I’ve also added a music video to accompany this tale. Enjoy.